Some 30 years ago, in an essay titled “How to Manage the Boss,” Peter Drucker suggested that the central task of a manager is to “make the strengths of people effective and their weaknesses irrelevant”—an insight that applies as much to one’s superior as to one’s subordinate. He then added some specific do’s and don’ts for managing upward: Ask the boss at least once a year what you do that helps make his or her life easier and what you do that makes life harder. 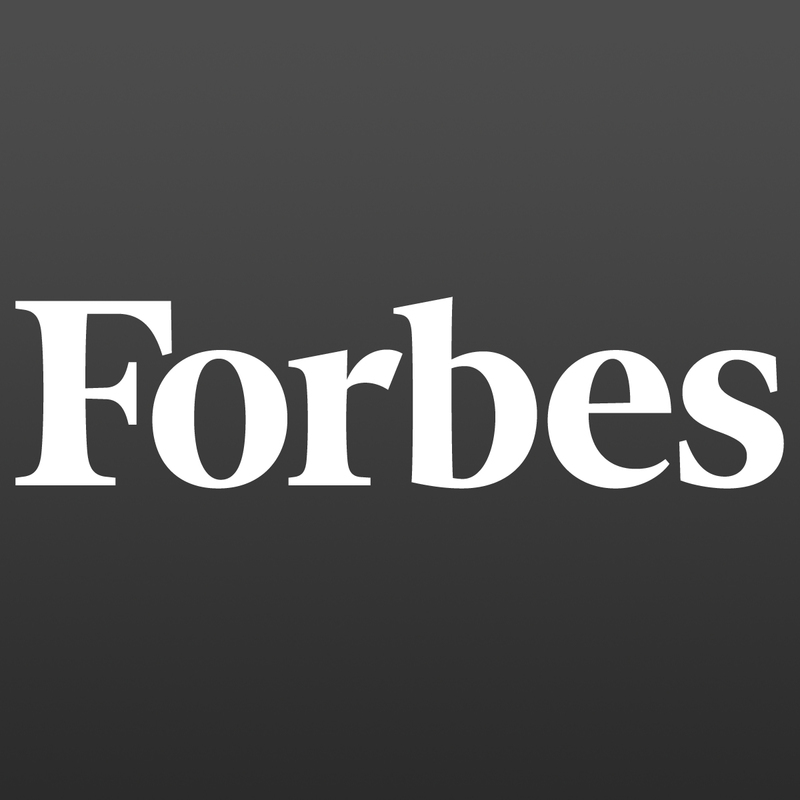 Understand your boss’s idiosyncrasies and learn to work with or around them. Make sure you and the boss understand what’s expected of you. Don’t expose the boss to surprises. And don’t underestimate the boss. Although these rules clearly still apply today, we’ve built on Drucker’s wisdom by asking seven of America’s most successful executives how they manage the boss. All of us, whether we know it or not, have early experiences with managing the boss. As Topgolf CEO Erik Anderson (more on him below) points out, parents or guardians are our first bosses. And as soon as we become capable of thought, we’re trying to figure out how to manage them as much as they’re trying to figure out how to manage us. They can’t fire us—though sometimes they surely wish they could—but parents and other authority figures have invariably taught us many of the basics by the time we enter the workforce. Then comes a real boss, the sort of person who pays you to make a contribution to the organization—and can dismiss you when you don’t. This person manages you, to be sure, but good employees also manage the boss. Approach the boss at least once annually to ask what you do that helps the boss and what you do that makes life harder for the boss. 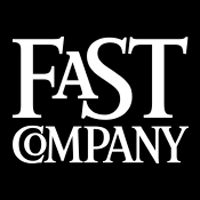 Understand your boss’s idiosyncrasies and learn to work with or around them. Make sure you and the boss understand what’s expected of you. Don’t expose the boss to surprises. 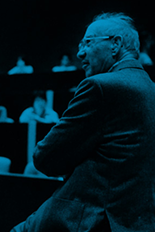 In the three decades since Drucker’s article was published, other scholars have weighed in on the subject of managing the boss, and discussions of the practice have become common. Some skeptics think it’s best avoided altogether, feeling that those who want to “manage the boss” often engage more in sycophancy and politicking than anything healthy. 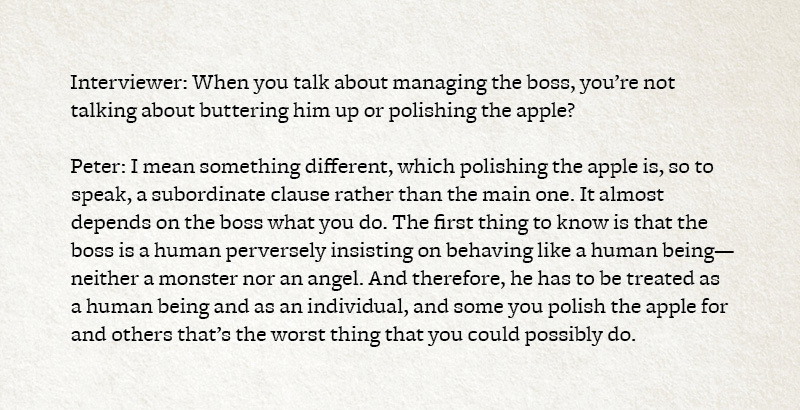 Then again, if that’s your approach to managing the boss, it’s likely to backfire sooner or later. Our goal is to build on Drucker’s original thinking and harvest some additional rules for managing the boss. How have some of America’s most successful executives—in business, the social sector and government—approached the task? Here are what seven of them had to say. The Drucker Institute’s Phalana Tiller visits the New York offices of 10x Management, where founder Rishon Blumberg explains how working with entertainers and tech talent provides clues that we can all use to help manage the boss. When David Williams, who today is the president and CEO of Make-A-Wish America, went to work as chief operating officer for Habitat for Humanity International in 1994, he’d been warned that his new boss, founder and CEO Millard Fuller, was hard to work for. Fuller also disliked prolonged discussions or wonky details. “He was not going to be up for a 45-minute presentation on why we had to pull out of a certain country,” Williams recalls. And so it was that Williams decided to take on a difficult budget situation largely on his own. True to his word, Fuller cast the lone dissenting vote. Williams was stunned. “I figured, all right, this is my first and last Habitat board meeting,” he says. Afterward, board members approached Williams to reassure him that he’d done well and not to take it too hard. Eventually, Fuller got over his displeasure, as well. But Williams had learned a lesson: Sometimes, you have to consider more than someone’s words to figure out what they really care about. Risa Lavizzo-Mourey has worked in senior roles at a variety of organizations, helping her to appreciate an important principle for managing the boss: Keep him or her in the loop, especially during times of upheaval. Risa Lavizzo-Mourey, CEO of the Robert Wood Johnson Foundation from 2003 until this year, has pulled off many transitions in her career—from doctor of medicine to university professor to federal official to nonprofit leader—and has served all manner of bosses in the process. One of her most challenging chapters came nearly 25 years ago, when she was working in Washington as deputy administrator of the Agency for Health Care Policy and Research (now known as the Agency for Health Care Research and Quality) at the Department of Health and Human Services. She had taken on her job during the George H.W. Bush administration, but in January 1993 a new president, Bill Clinton, was coming to town. Both Lavizzo-Mourey and her boss were staying in their roles, but the nature of their work was bound to change. Sure enough, healthcare reform soon emerged as a major priority for President Clinton, and he wanted agency experts to work with closely with his staff to develop policy. For Lavizzo-Mourey, this meant that she was spending 80% to 90% of her time offsite at the White House, while her boss, whose responsibilities were broader, had to stay behind at HHS. Throughout this period, communication with the boss remained the key to harmony and success. That sounds simple enough, but communication often runs contrary to instinct, particularly in times of uncertainty. You want to put your own best foot forward … But that extra time is precisely what can cost you the trust of your boss and create a sense of betrayal. When Guy Kawasaki became Apple’s “technology evangelist,” in the 1980s, he already had some sense of how to be responsive to the boss. But he says it was marriage that taught him his most important lesson in this arena: Make the boss’s priorities yours—and right away. So respect that person’s sense of urgency—and get moving. Now. Like many leaders, Frank Blake, who is credited with a stellar turnaround of Home Depot during his tenure as CEO from 2007 to 2014, learned most of his boss-management lessons early in his career. In the 1980s, Blake served as general counsel of the Environmental Protection Agency. It was a vantage that brought home to him the mordant Washington adage “Where you stand depends on where you sit,” meaning that your opinions and priorities tend to be determined by your perch. In the case of government managers, they are typically protective of their resources—and are often angling for more. “I saw this procession of people saying, ‘Whatever I had last year, I’ll need 3% or 4% more this year to do it, or better yet 20% more,’” Blake remembers. Of course, this is normal for employees in any sort of organization—whatever sector they’re in. The trouble, says Blake, is that managers have a tendency to think of themselves as representatives of their departments, for which they’re going to bat when they meet with the boss. For them, “managing the boss” means getting the boss to do what the department would like the boss to do. You can be your organization’s ambassador to your boss, or your boss’s ambassador to your organization. The latter is the right way to go. Every boss has a different way of communicating, notes Samuel Skinner. He should know. He has had all sorts of them—from the C-suite to the Oval Office. “Some bosses will tell you one thing but they mean something else,” says Skinner, who served as Transportation secretary and White House chief of staff under President George H.W. Bush, and then became president of Commonwealth Edison and CEO of transportation giant USF Corp. Today, he is of counsel to the law firm Greenberg Traurig. This is clarifying to both boss and subordinate. What’s more, it gives the boss a second chance to shape his or her own thoughts. Sometimes, hearing them expressed from an outside source also leads the boss to change his or her mind. This was an especially important skill for Skinner when he became President Bush’s chief of staff. But he first became aware of its importance at the start of his career, when he was a salesman for IBM in the 1960s. “They trained you to listen to the customer,” he says. “When you’re busy trying to get the order you can get focused on selling to customers rather than satisfying them.” Listening and playing back customer concerns made all the difference. As founder and CEO of WestRiver Group and CEO of Topgolf Entertainment Group, a global sports entertainment company of over 14,000 employees, Erik Anderson knows a thing or two about the importance of keeping your eye on the ball. But what’s also imperative, he says, is helping the boss keep his or her eye on the ball—something he learned decades ago when he was a vice president at Goldman Sachs. His boss, a managing director and partner (Goldman had yet to go public), was overseeing a fast-growing department devoted to mortgage-backed securities. This involved many simultaneous goals: improving performance, increasing the team’s expertise, grabbing higher market share and hiring to kept pace with growth. What the boss couldn’t see, however, were the specific ways that tasks might exceed capacity, creating bottlenecks in different parts of the organization. The challenge for Anderson was in finding a way to communicate this to his boss diplomatically. There was the risk of angering colleagues by seeming to cast them in a poor light or by minding the business of other teams. Then there was the risk of looking like a complainer. But there was also the reality that any boss requires objective information as soon as possible. “The higher up in the organization you get, the harder it becomes to get clean data,” Anderson says. Anderson thought carefully about when to deliver the data and how to package it, to make sure that no one was made to look bad. The timing had to be after a successful completion of a task. The message also had to be simple and non-judgmental: “These are things that I’ve identified as challenges for others or myself, and they might be worthy of investigation.” This spared Anderson from stepping on toes but gave his boss information that was important as he tried to figure out how to make his teams more effective. But Buckley still has many informal rules for managing the boss—several of which came together in the late 1970s, when Buckley was a young man of 30, a recent arrival from England, working at a company in the United States. So it was only natural that company leaders would approach Buckley with a retention offer: Would he stay in his old department and replace his former boss? Nonetheless, Buckley’s refusal was met in this case with consternation—and pressure. A parade of leaders tried to make Buckley relent and take the job of his sick boss. Art’s supervisor told Buckley that it wasn’t his business to manage Art’s career but to manage his own. So did Art’s boss’s boss. So did the company’s vice president. All of this pushback left Buckley second-guessing himself. “Am I being stupid and ruining my chances to progress in this company?” he recalls wondering. Then, after a couple of weeks, Art’s boss, Tom, presented Buckley with a new idea. Tom would divide his job in two and promote Art to Tom’s own level, leaving room for Buckley to take Art’s place. “I realize that what you said was right and that this was a way to solve the problem,” Tom told him. “Now does this solve your dilemma, George?” It did. Months later, when Art had returned to work, he called Buckley into his office. Buckley had never told anyone about the negotiations following Art’s heart attack, But Art had learned of them all the same. “Not many people would have had the moral strength to do what you did,” Art said. The two remained close friends for the rest of Art’s life. 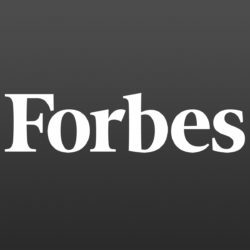 Present your boss with a “Manager’s Letter,” a tool introduced in Peter Drucker’s 1954 classic, The Practice of Management. In it, make clear what your objectives are and what you think your boss’s objectives are—and how they align. Assess what information your boss needs from you to make good decisions—as well as when he or she needs it, and in what form—and ask yourself whether you’re really delivering. 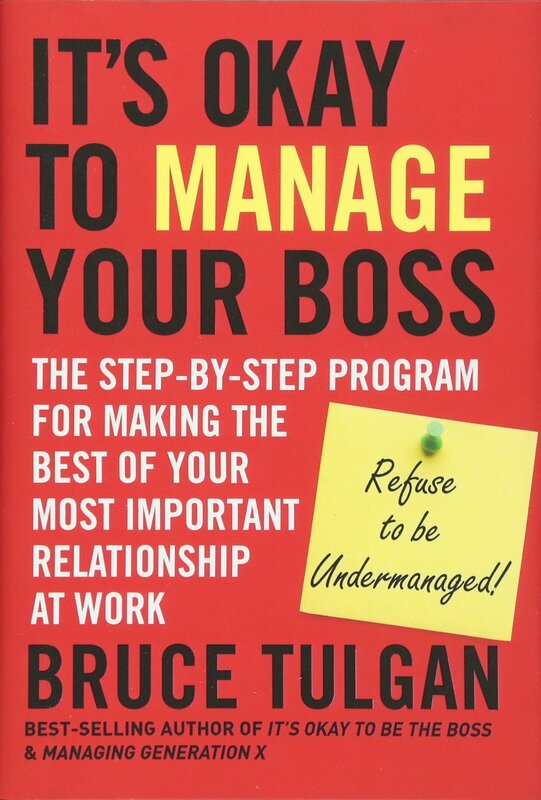 This book is based on two Harvard Business Review articles, one from 1993 and the other from 2005, and the authors are among the first scholars (besides Peter Drucker) to take an in-depth look at how to manage the boss. Misguided approaches often involve sycophancy and manipulation. 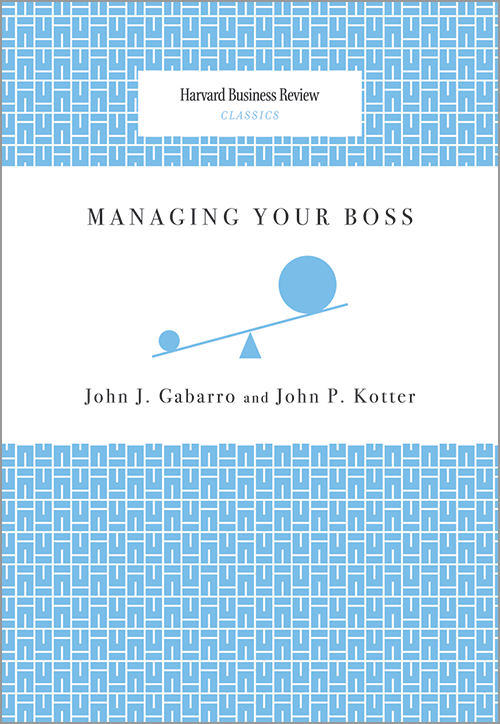 The right approach, argue Kotter and Gabarro, is to become familiar with your boss’s mindset, preferred modes of communication, goals, strengths and weaknesses, and forge a partnership based on trust and mutual respect. They also offer practical advice about how to go about this. This short read gives a nice introduction to the question of how to balance the responsibility of managing your employees with that of managing your boss. Some of the advice (such as “toot your own horn”) offers a reminder of why “managing the boss” is a fraught idea that doesn’t find universal favor. But other concepts—such as understanding your role as manager in terms of the goals of your organization and helping your employees to do the same—are clearly wise. The article also includes input from three different authors of books on upward management. Some of the statistics in this article might lead to a raised eyebrow or two.  The authors, based on data from several thousand marketing executives, posit that managing up and sideways is about 50% more important than managing subordinates for business success and well over twice as important for career success. But the article also offers concrete ideas and details, and it’s a useful reminder that if you’re focused on managing your subordinates to the exclusion of peers and superiors, you’re probably missing the bigger picture.